Full Price: $ 130.00 4% off! Vogue 2004 reproductions of the early 1950s vintage strung Ginnys with painted eye lashes. This doll set includes 7.5 inch Binky and Bunky dolls in blue knit skirt for the girl pants for the boy that are being sold as pair only. 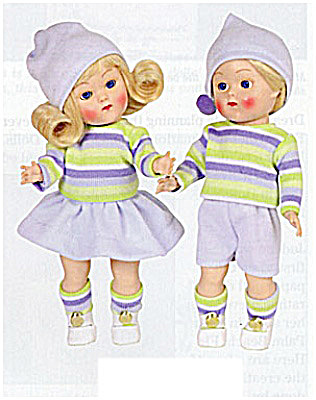 The Vintage Reproduction Boy Bunky and Girl Binky Ginny dolls resemble the original strung dolls from 1951-53 with painted lashes. Both dolls have blonde wigs and moving blue eyes. The girl has bangs and a flip curls hairstyle. They are wearing matching pastel blue, white, and chartreuse knit shirts; blue knit hats with blue pompom; pastel striped socks to match shirts; and white center-snap shoes. He is dressed in blue knit shorts, and she is wearing a blue knit skirt. These dolls look much like the extremely expensive and rare vintage dolls. Retired dolls are new old stock, and mint-in-their-boxes. They are in a limited edition of 1,000 each.